The dynamic interactions of water molecules. 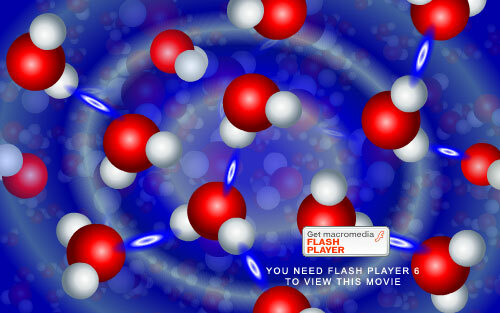 Individual H2O molecules are V-shaped, consisting of two hydrogen atoms (depicted in white) attached to the sides of a single oxygen atom (depicted in red). Neighboring H2O molecules interact transiently by way of hydrogen bonds (depicted as blue and white ovals). Strong linkages—called covalent bonds—hold together the hydrogen (white) and oxygen (red) atoms of individual H2O molecules. Covalent bonds occur when two atoms—in this case oxygen and hydrogen—share electrons with each other. Because oxygen and hydrogen attract the shared electrons unequally, each end of the V-shaped H2O molecule adopts a slightly different charge. The area around the oxygen is somewhat negative compared to the opposite, hydrogen-containing end of the molecule, which is slightly positive. Opposites attract, so this lopsided charge difference allows bonds to form between the hydrogen and oxygen atoms of adjacent H2O molecules. Each H2O can bind to a maximum of four neighbors through these so-called hydrogen bonds. Although short-lived and much weaker than the covalent variety, hydrogen bonds contribute significantly to water chemistry because they are extremely abundant in H2O.